Home Articles What Is the Will of God & How Should Christians Interpret It? Ask any pastor. The question is always in the top five: “What is the will of God for my life?” The question is undoubtedly the familiar echo of a faraway primordial cry of the human heart. Visualize ancient peoples on a frozen European tundra or a barren African desert landscape looking up and into the endless star-studded night skies. Feeling small and recognizing that there is an undeniably greater power at work in the world, a man and a woman—now living east of Eden, after “the fall”—scream in eternal silence at the unfathomable and the unknowable cosmos above. Fast-forward a little closer to your own life. Greg’s crisis is an everyday crisis; it’s our crisis. Greg’s ordinary question—one that is posed in desperation at one time or another by all of us—transcends economics, education, and background. Greg stands with you and me and our ancient tribal ancestors, still looking into the endless night skies. “God, I want to know Your will for my life.” We know it is wrong to play “fortune-teller.” But it seems wrong to say that the Bible cannot give us assurance that we can know God’s will. We can’t afford to ignore the question. Somehow we must seek God and His will. But can we really know God’s will? The simple answer is “Yes. You can know the will of God.” However, to come to terms with “knowing the will of God,” we must approach Scripture with a careful understanding of what God has revealed. 1. The Bible teaches there is a decretive will of God. The “secret things” are God’s decrees. The Sovereign God decreed that there be light. Light had no choice in the matter; it had to shine! Why? Because God is God and light is subservient to the Almighty. God decreed that you would be His child before the foundation of the world. This is what the Apostle Paul wrote in Ephesians 1:4: “even as he chose us in him before the foundation of the world…” Of course, you must repent and believe. The oft-repeated command recognizes the responsibility of human beings: “Jesus came into Galilee, proclaiming the gospel of God, and saying, ‘The time is fulfilled, and the kingdom of God is at hand; repent and believe in the gospel’” (Mark 1:14–15). So, God has “decreed” whatsoever comes to pass, using “direct” (or “immediate”) means (“And God said, ‘Let there be light,’ and there was light’” Genesis 1:3) and “secondary” (or “mediate”) means(“then choose for yourselves this day whom you will serve” Joshua 24:15). All of His decretive will is accomplished without “willingly” afflict[ing] the children of men,” (Lamentations 3:33), or ever being charged with evil (e.g., 1 John 1:5), or damaging the liberty of humankind (e.g., John 19:11). In other words, God is sovereign. You are responsible. Life is not deterministic. Yet, we must state emphatically, God is God and we are not. “Okay,” says our friend—head down on the steering wheel now—“You’re saying I cannot know His will? That’s just great! What is the use then?” Do not let your heart be troubled. God is God and you are not, but wait: there is good news in that statement, too! Give attention to the other side of Deuteronomy 29:29. Though the secret things are God’s, “The revealed things belong to us to know and to our children forever, in order to do all the words of this law.” This is the second aspect of the will of God: God’s precepts are known. Those precepts allow us to discern the will of God made plain. 2. The Bible teaches there is a preceptive will of God. By “Word,” we mean to say all of the ways that God’s Word is taught: Preaching, teaching, small group Bible studies, counseling, and your own private daily devotions. In this way, one’s heart and mind are saturated with the Word of God. Then, you may know His precepts, His will. The Sacraments draw us to our Savior, Jesus Christ. Baptism (administered once, but observed repeatedly gives a picture of God’s power to engraft us into His one Body. The Lord’s Supper, or Communion [or Eucharist, i.e., the Thanksgiving], are the authentic God-given signs that recalibrate our lives to Calvary’s cross and to our salvation in Jesus our Lord. Prayer, then, coalesces Word and Sacrament (the cognitive and the emotive; the word and the picture) into an appeal of the human heart. This sacred moment seals the Word and Sacrament in an intimate relationship between creature and Creator. It is often here—on your knees, after you have considered a matter with God’s revealed will in His Word, His Spirit’s illumination through Sacrament and Prayer—that you apply Truth with wisdom. For wisdom is a gift: “For the Lord gives wisdom; from his mouth come knowledge and understanding” (Proverbs 2:6). Wisdom is not only a divine gift of God but one that is promised if you ask in prayer, through Jesus: “If any of you lacks wisdom, let him ask God, who gives generously to all without reproach, and it will be given him” (James 1:5). God’s precepts are His will to you. By diligent attention to His Word, through the repeated reorientation of your mind and heart to the Cross of Christ in the Sacraments, and by diligently seeking Him in prayer you will come to know the will of God. As Solomon wrote to his son so it will be in your life: “So you will walk in the way of the good and keep to the paths of the righteous” (Proverbs 2:20 ESV). 3. The Bible teaches there is a dispositional will of God. This expression of God’s will—His attitude or “disposition”—noted in Scripture is part of His decretive will, but bears special attention, and, thus, becomes the third category. The Lord has shown us what is good, what pleases Him, and what will bring praise to Him. We know, for instance, that the Ten Commandments (Exodus 20:2-17; Deuteronomy 5:6-21) cannot save us from the wrath of God against sin. However, the commandments point to a need for a Redeemer who can live the life we cannot live and die a death to pay for our trespasses against God. There is another use of the law: the “practical use,” says John Calvin, to guide us according to what pleases God. In many other places, the Lord reveals His will for us in terms of what pleases God. Perhaps, the most famous passage that speaks to this aspect of the Lord’s will is found in the prophet Micah: “He has shown you, O man, what is good; And what does the Lord require of you But to do justly, To love mercy, And to walk humbly with your God” (Micah 6:8)? So, the will of God is decretive (whatever He has determined by His own secret counsels), perceptive (what He has revealed in His holy Word, the Bible), and dispositional (what He has shown in Scripture that pleases Him). Back to Greg in the VW at the stoplight. Greg will need to draw from the Bible sermons that have nurtured his soul. He must feed on the Word from those early morning Men’s Bible studies at the coffee shop. Greg might not even know it, but the deep, unutterable moments lingering before the Lord’s Table, drawing his spirit to Jesus the Lord, works together to give him discernment. He needs no fortune teller. He has no need to guess the decretive will of God and hope that he makes the right decision to “line up” with that unknowable will. No, Greg has all that he needs. By the power of the Word and Spirit at work through the wisdom gained in diligent attention to God’s revealed will, Greg can discern, by godly wisdom, with Sally (and, perhaps, in confidence, with a pastor or counselor) what is good and right before the Lord. You do not need to fear about lining up your life to an incomprehensible (but very real) decretive will of God. You seek God’s will by His Word and Spirit. And if you feel you missed it, God is there. For you are sealed; you are His child. God loves you and He will never let you go. And the very things that seek to work against you become, in the hands of this sovereign God, the very things that lead you home. That is what the cross of Christ is all about. What was God’s will? That question is what Jesus wept blood over in the Garden of Gethsemane. And the answer? Abandonment on a cross. The creatures murdered the Creator. And yet . . . the gore became the glory. The shame was transformed into honor. The failure became the victory. The devil’s purposes are shaped precisely to the Lord’s plans. This is the power of the cross. And that power is at work in your life if you have received Jesus Christ as your Lord and Savior. 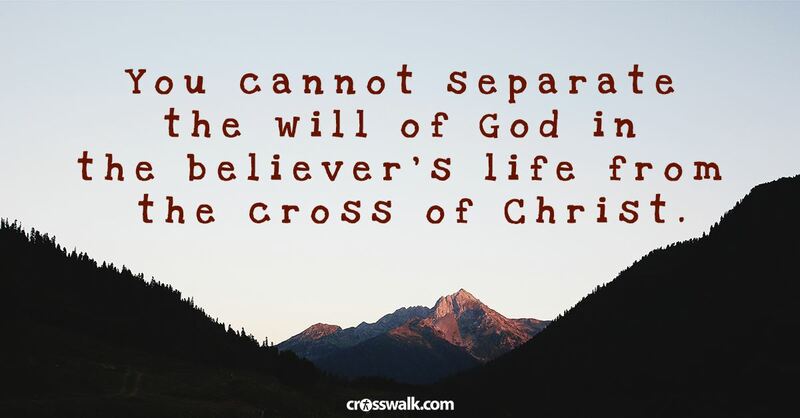 You cannot separate the will of God in the believer’s life from the cross of Christ in His Son our Savior, Jesus Christ. Our lives follow the ruling motif of the cross of Christ. And in this we are safe. In this, we are saved. So, Greg: look at what God has said about those several variables you mentioned (Sally, the children, your own ambition). It may be that this is a good move. It may be that God is more glorified in remaining where you are. But one thing is for sure: you will never regret the sacred time in your life of “wrestling with God” over the thing to do. You can know the will of the Lord for your life. And you never have to look further than the cross of Christ. Boa, Kenneth, and Robert M. Bowman Jr. Faith Has Its Reasons: Integrative Approaches to Defending the Christian Faith. InterVarsity Press, 2012. Burrell, David B. Knowing the Unknowable God: Ibn-Sina, Maimonides, Aquinas. University of Notre Dame Pess, 1992. Calvin, Jean. Concerning the Eternal Predestination of God. Westminster John Knox Press, 1997. Calvin, Jean. Institutes of the Christian Religion. Vol. 2. Presbyterian board of publication, 1844. Calvin, John. Commentaries of the First Book of Moses Called Genesis. Lulu. com, 2018. Day, Collin. Collins Thesaurus of the Bible. Logos Bible Software. Bellingham, WA: Harper Collins, 2009. https://www.logos.com/product/25679/collins-thesaurus-of-the-bible. Elwell, Walter A., Barry J. Beitzel, H. Douglas Buckwalter, Peter C. Craigie, James Dixon Douglas, Robert Guelich, and Walter R. Hearn. Baker Encyclopedia of the Bible. Vol. 2. Baker Book House Grand Rapids, MI, 1988. Gerrish, Brian A. “‘ To the Unknown God’: Luther and Calvin on the Hiddenness of God.” The Journal of Religion 53, no. 3 (1973): 263–92. Gerstner, H. John, and R. C. Sproul. Wrongly Dividing the Word of Truth. Wolgemuth & Hyatt, Publishers, 1991. Heschel, Abraham Joshua. The Prophets. Vol. 2. Harper & Row New York, 1962. Owen, Robert Dale. Footfalls on the Boundary of Another World. [sn], 1860. Packer, James Innell. Knowing God. InterVarsity Press, 2011. Reymond, Robert L. A New Systematic Theology of the Christian Faith: -Revised and Updated. Thomas Nelson, 2010. Reymond, Robert. “The Justification of Knowledge.” Presbitarian and Reformed, Philadelphia, 1976. Smith, M. Blaine. Knowing God’s Will: Finding Guidance for Personal Decisions. InterVarsity Press, 2009. Sproul, Robert Charles. Can I Know God’s Will? Reformation Trust, 1984. Sproul, Robert Charles. Chosen by God. Tyndale House Publishers, Inc., 2011. Swinburne, Richard G. “Duty and the Will of God.” Canadian Journal of Philosophy 4, no. 2 (1974): 213–27. Waltke, Bruce K. Finding the Will of God: A Pagan Notion?Wm. B. Eerdmans Publishing, 2016. Zachman, Randall C. Image and Word in the Theology of John Calvin. University of Notre Dame Press Notre Dame, IN, 2007.